In the winter of 2012, authorities rescued a group of starving, neglected horses from a barn in Groveport, Ohio. Experienced rider and Franklin County Sheriff Corporal Sam Byrd was called into the case by investigators and Corporal Byrd saw something remarkable in the eyes of a weak and malnourished Tobiano American Paint. Corporal Byrd thought he could work with the horse to become a part of the department's mounted patrol unit. 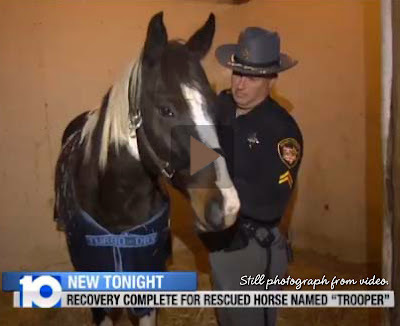 All participants in the Franklin County Sheriff's Mounted Patrol Unit care for their mounts out of their own pockets, and Byrd started caring for and working with his new charge, Trooper. Over the next year, Trooper recovered physically, gaining about 300 pounds, and Corporal Byrd and Trooper, worked together, step by step, to build a relationship. Next, Trooper and Corporal Byrd trained together to become a mounted patrol team. Horse and rider debuted on March 17, 2013 on-duty at the Columbus St. Patrick's Day Parade as the newest members of the Franklin County Sheriff's Mounted Patrol. April is Prevention of Cruelty to Animals Month. Give your pets an extra hug. Take a heartbeat to just enjoy them in all their glory as they play with abandon, relish simple things like the warmth of the sun, and offer you their unconditional love. And, say a small prayer of love, protection, and care for pets in need. People can also love animals from afar. If you'd like to have a pet in your life, but have decided not to because you understand the commitment - bless you for your selflessness. What do we learn from animals: Having the grace, patience, and self-love to just be. Photo from news story video - WBNS TV.